There has never been a president that has shown such disregard for the United States Military. 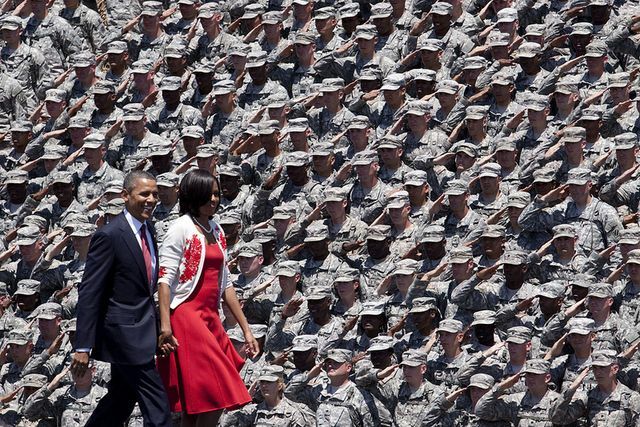 It’s no secret that Obama has had a very contentious relationship with the military. Heidi Shyu, who is the Army’s assistant secretary for acquisition, logistics, and technology, made the claim when asked about the deep spending cuts that are taking effect throughout the military. “We are already at that point,” she said when talking about the military’s threat readiness being negatively affected. She explained that out of all the branches, the Army has the smallest research, development, and acquisition budget, and lamented that there are still more debilitating budget cuts to come. Obama and the Democrats unwillingness to cut spending in any other area led to the drastic reduction in military spending. And this, of course, has consequences. One of them being that the shortsightedness of specifically the Army’s reductions actually leads to increased costs, because the money isn’t their to make bulk purchases, which provides steep discounts. So the Army is purchasing less but at a higher price. “It’s not better buying power. It’s much worse,” Shyu said. Obama’s lack of leadership and refusal to get his spending under control has damaged the military’s ability to protect this nation. With new and old threats popping up all over the world, Obama has decided to weaken our military and trust his own knowledge over those at the Pentagon. If the United States wants to be able to survive in an increasingly hostile world, the cuts must reversed and military advice heeded. Under the Obama administration our military has had a rough go of it. They’ve had to watch their work be undone in Iraq and a foreign policy that would be generously described as bumbling. At a minimum they deserve respect and praise at home!